Today we’re taking a tour of the $12.9 million Rancho Alegre that sits on 175 acres of Southwestern ranchland in Santa Fe, New Mexico. It was designed by the renowned architect William F. Tull and featured in the June ’08 issue of Architectural Digest. 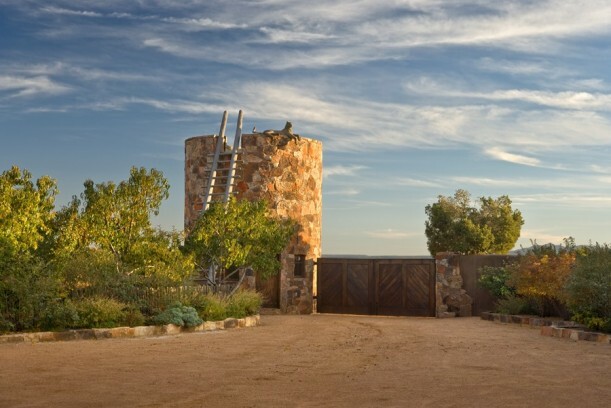 Besides the 13,000 square-foot main house, the property also comes with a four-bedroom guest house, caretaker’s quarters, carriage house, and equestrian facilities that include 12 horse stalls and a large riding arena. There are 13 bedrooms in the house, and 11 full baths. The master bath is like a work of art. Stonemason John Morris modeled the space after the pueblos at Chaco Canyon. The 20’x15′ shower features a cascading “water wall” that incorporates a sculpture by artist Michael Naranjo. But that’s not all! There’s also a tile-lined Roman tub, and a romantic corner kiva wood-burning fireplace. For more photos and information, check the Sotheby’s listing. It was featured in Architectural Digest in 2008, and I believe many of these photos were originally published there (photographer Robert Reck). wow… absolutely stunning. such an amazing home! thank you so much for sharing! Those light fixtures amaze me! Each and every room is stunning Julia and those ceilings! Then there are the paintings, saddles, chaps. The Replica of the Plains Indians!! It’s interesting to look at different types of homes. I just don’t know if I could live in a house like this one though. Seems a little dark and gloomy for my tastes. Thanks for sharing this with us Julia! This house is pretty cool and unique. It’s one of those places I would love to stay in a couple times just for fun, but wouldn’t want to live in. The inside looks so much better than I thought it would. I was expecting it to look like the HGTV peublo dream home. It’s so much nicer than that house. This home is incredible- incredible massive that is but the detailing inside is prettry right on and accurate. Although massive- they have detailed certain rooms so that you won’t feel entirely out of place. The whole house could be a museum itself. Who needs a house this big though? Not really my style but it is beautiful! My kind of shower for sure. I presume there is an outdoor shower too. I do love the bathroom – look at that shower! – and the garden by the way. Not a fan. The house seems way to large and ornate for me. Very masculine. Some parts are rather beautiful but much of it seems overdone. Not sure about taking a shower in the middle of a room! It seems like it would make a nice Inn, and I imagine the grounds would be lovely to walk on a warm evening as the sun sets. Well, it’s big and it’s a lot of house but I don’t find it remotely attractive. Just not my style at all. Beautiful but don’t think I could enjoy living in a museum/airplane hanger! Love some of the details, especially using the repurposed bricks in those arched ceilings! But this home is so large and many rooms (including the bathroom) so expansive and “empty” feeling that I kept thinking it looked like the house could be a mall of specialty shops. I couldn’t be comfortable living there but it is indeed an impressive house! Thanks for sharing! Wow. Very interesting with some amazing elements, but not my style at all. Wouldn’t mind a visit, but not an overnight stay. As a child I had recurring dreams of being hunted by indians (watched too many TV westerns, I suspect), so a night stay would be out of the question! Not something I would live in. But would be great as a high end retreat! Nice place, very well accomplished, despite its size it looks welcoming and cozy. I don’t think I could live there though, I would miss the trees and some lush vegetation. Ok…I have just learned that there IS such a thing as TOO big in my world! As much as I love Santa Fe…and Horses and adobe…THIS is just too much of a good thing. Where in the WORLD do people get so much money? Would I want to live there? Oh yes! Hmm, my husband and I were talking about moving to New Mexico. Now we just need to convince 59 of our closest friends to chip in for this house! This place is really unique and beautiful. Honestly, it’s not my style, but I wouldn’t complain if I had to live there! 🙂 That bathroom is stunning. How unique! I haven’t seen this house before and I’m glad you’ve posted about it. Wow, it’s amazing! BUT…I can’t imagine calling it home, it just doesn’t seem very “homey”…and a 20 x 15 shower?? I’d love to spend a couple of days there as a guest. As a home, even though we live in the wild west, nope. I admire the craftsmanship, but that’s a showpiece, not a home. I’m all about the cozy, and this is too cavernous to be cozy. the bath is wonderful…..and loads of other beautiful touches….I’d take down the chandeliers in the piano room….way too many there! thx for sharing…hope you’re doing well….. 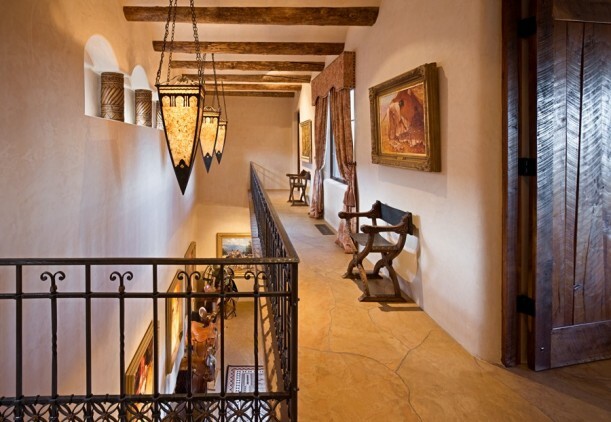 It is a beautiful home but I would like some more “southwestern” colors that I think of after going to Sante Fe. Although the kitchen is unique, it’s too dark for my taste. I’m originally from New Mexico and I can assure you that the average resident does NOT live like this! 🙂 While the home’s style represents both the Hispanic and Indian influences of the region, it is very over-done. It looks and feels very similar to the art and cultural museums in Taos, Santa Fe, and Albuquerque. Not comfortable as a home, at all, in my mind. We used to say that the Texans ruined the real estate market when they bought secondary homes in the state. Now it is the Californians who come over and over-pay for the market! I’m surprised to admit that I actually kind of love it. I would not want it to be my personal home, but like as a resort or something that would be pretty cool. Thank you so much for dropping by and leaving me that sweet comment. Not my style at all! Too big! Really didn’t like much about it. I’m sure that somebody will love it though. Wow, I couldn’t live there. It would be an interesting place to tour and visit though. I love this house. Even as big as it is. The character is so fitting with that part of the country, and the enormous rooms make you feel like you’re walking into a museum. I especially like the scalloped ceiling in the bedroom, and the huge shower with the two towers in the middle. Wouldn’t have to worry about shower curtains, and wifey and I could shower together without fighting over who gets the water! You're in for the ecneriepxe of a lifetime. Having sung several Mahler 2nds with the BSO, I can attest that it may be the mostly emotionally satisfying piece I've ever performed. Not just the first time, but every time. You're lucky to do this with the SFS. Good luck! Totally not my style, but beautiful nonetheless! The house is definitely not my style, but we love Santa Fe. Our family rented a condo there for Christmas. We had hoped to ski, but with little snow, we got in only one day. The rest of the holiday was spent exploring the city, walking around the charming square and viewing art galleries on Canyon Road. It is a magical place at Christmas. Canyon Road is lit by literally thousands of luminaria. As we walked up Canyon Road on Christmas Eve we overheard a policeman say that there must be 10,000 people on the street that night. Thanks for reminding me of our fun time at Christmas. That house makes me think of the house on Weeds that Esteban lives in. And I know it sounds absolutely ridiculous, but I love the idea of the ginormous shower. I’d just want mine in blue, thanks!